So I pulled some of my old stuff out...tarnished and all.. 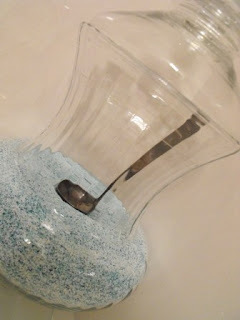 The sweetest girl, Shannon at Bless Our Nest had a post on putting the everyday stuff in something pretty. She dressed up her washingpowder in a pretty container. Now how creative is this. So I thought my calgon could use a little help. This is so cute. This idea came out great. It is so pretty it might just make you want to do the laundry! Love this post! What a great idea...I'm thinking I might need something like that. Thanks for stopping by my blog to say hello. 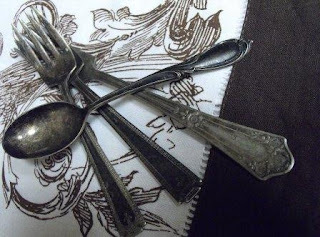 Love this idea...especially since I am seem to have a thing for old silverware!!! Have a great weekend! Ooh! I WILL add you to my list! I love your grass planting idea, and I love the soap by the tub. I, too, will be back when I have more time. Right now I'm sneaking in this comment while my husband cleans the car! EEKS! :-) Thanks for stopping by...friend! Never woulda thought about it! I have a vase (the one I bought for Kayla's b'day centerpiece), it's sitting empty on my coffee table. I am gonna buy some cute little glass beads and throw in a couple of tarnished pieces of silver! Hi there, thanks for commenting on my blog. I love to receive them! I love your jar. 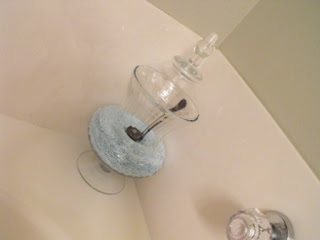 I have been looking for an apothecary jar for a long time...I wanted to put one on my tub for bath salts. I'll have to try TJ Maxx..what I really like is Southern Living at Home's..thats a gorgeous one. 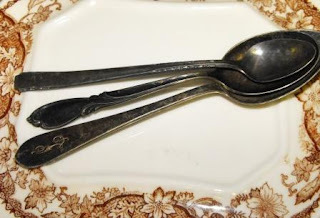 I have some old tarnished silverware around here someplace. I'll have to try this. I love the grass idea. I think I have some around here, I can try to transform. love, love, love your blog!! I have your button on my blog and find something neat here each time I visit!! Who needs HGTV indeed ( I just canceled my cable today) I get better ideas like yours through blogs! It looks so elegant...as soon as I think my babies won't eat it, I'll have to do this! Too bad my unscented liquid All detergent wouldn't look as pretty in an apothecary jar! Your Calgon looks nice! I hardly ever watch HGTV anymore either. There's much better inspiration in blogland! I love your use of the apothecary jar. There was a whole section in a decorating book I just read about containerizing everyday things in a pretty way. I think it's a great idea! Yum!!! I am loving that. Good job! I never watch HGTV....who has time?? HA! All I'm watching right now is FOX or CNN to see what's going on where my family is at in Iowa....what a mess. I love this post. You're new "Calgon take me away" container is so pretty. Love the ladle in there!! 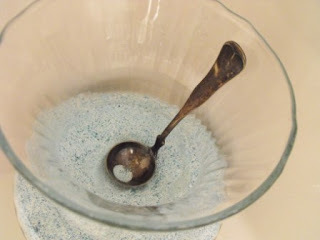 I am going to run home and put a ladle in my bath salts. Thanks for sharing!